Many other Guild members made haste to make slab blocks to Recover Southern Alberta. These blocks are 15-1/2 inches. Arlene, Margaret and I put our efforts together and the package I express mailed on Sunday was delivered on Tuesday, which is really pretty awesome considering. We made blocks in various colours, but all of us had made blue blocks. This photo shows why this design of Cheryl Arkison’s is such a brilliant choice for group projects, because each block was made by a different person. Top left is Margaret’s, mine is on the right and Arlene’s is below. I’ve been well and truly bitten by the slab bug and am working on what may hopefully become a group project, using 9 1/2 inch slabs to make baby quilts. 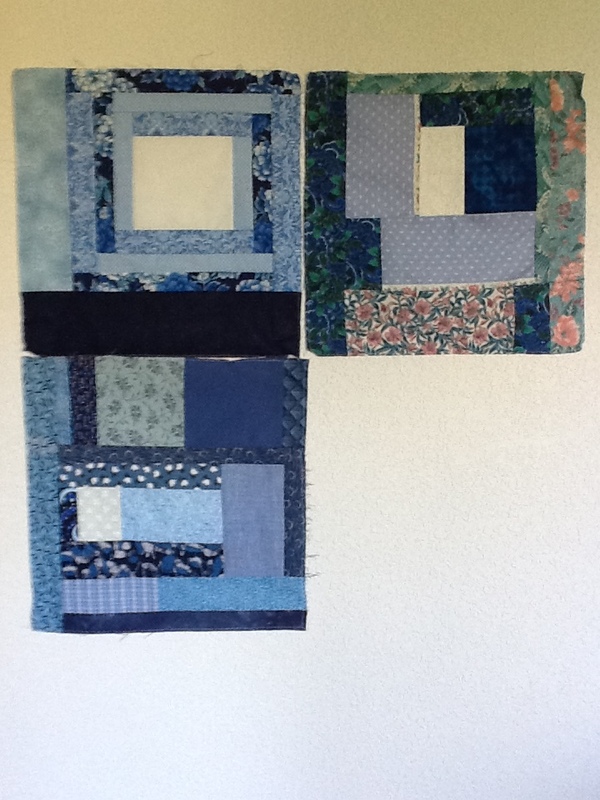 The photo below shows a few of the blocks I’ve made so far. I’m figuring 20 blocks to a quilt in four rows of five and hope to have a top assembled for show and share in early August. 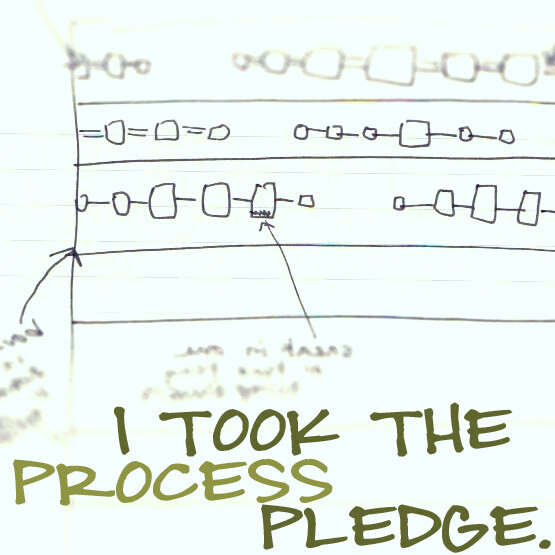 It’s such fun to see the projects people come up with to bust stash, so what are YOU doing? I’d love to know! These blocks are beautiful and really well balanced 🙂 I’m wondering whether it was a conscious or unconscious decision to give them an overall blue themed tonality? Being for flood relief, this theme is quite appropriate. I live in Calgary and got to see first hand our crystal blue Bow River turn churning brown with sediment. 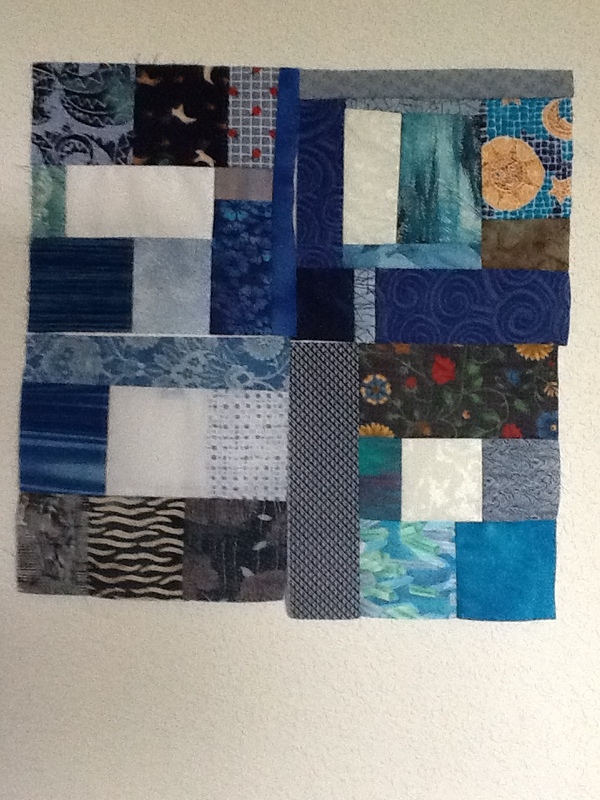 Great to see the blue coming back, in our river and in your generous quilting! Unconscious at least on my part, Cymbria! I’ve read somewhere that most people have more blue scraps in their stash than any other colour, and my stash of both yardage and scraps seems to reflect that. For the baby quilts I decided to keep on with blue at least to start with in hopes that others will join in, then move on to other colours later. Glad that the river is turning blue again!